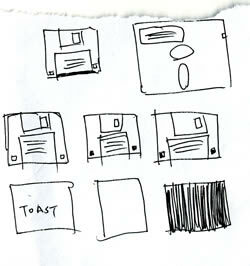 floppy disk variations by matt dennewitz thanks matt! Two oscillators that have the same frequency Archaeological phase and phasing refers and different phases have a phase difference, to the logical reduction of and the oscillators are said to be contexts recorded during excavation to out of phase with each other. The near contemporary archaeological horizons that amount by which such oscillators are out represent a distinct "phase" of of step with each other can be previous land use. These often expressed in degrees from 0 to 360, but not always will be or in radians from 0 to 2PI. a representation of a former If the phase difference is 180 degrees land surface or occupation level (PI radians), then the two oscillators are and all associated features that said to be in antiphase. If two were created into or from interacting waves meet at a point where this point in time. A they are in antiphase, then destructive interference simplified description of phase would will occur. It is common for waves be that" a phase is of electromagnetic (light, RF), acoustic (sound) or a view of a given other energy to become superposed in their Archaeological site as it would transmission medium. When that happens, the phase have been at time X". difference determines whether they reinforce or weaken examples of phases that would each other. Complete cancellation is possible for have no associated occupation surfaces waves with equal amplitudes. Time is sometimes are phases of a site used (instead of angle) to express position that have been horizontally truncated within the cycle of an oscillation. A by later phases and only phase difference is analogous to two athletes elements surviving of the truncated running around a race track at the phase are those that were same speed and direction but starting at below ground level and the different positions on the track. They pass subsequent truncation at that time. a point at different instants in time. Subsequent or earlier Phases are But the time difference (phase difference) between representations in changing occupation patterns them is a constant - same for and land use use over every pass since they are at the time. Phase is an extremely same speed and in the same direction. important concept in Archeological excavation If they were at different speeds (different and post excavation work. Phasing frequencies), the phase difference would only reflect is achieved by compiling smaller different starting positions. We measure the rotation groups of contexts together through of the earth in hours, instead of the use of stratification and radians. And therefore time zones are an stratigraphic excavation.